n April 6, 2018, NJDOT held a Lunchtime Tech Talk with Dr. Nenad Gucunski, Director of the Center for Advanced Infrastructure and Transportation (CAIT) Infrastructure Condition Monitoring Program and chair of the Department of Civil and Environmental Engineering at Rutgers School of Engineering. Dr. Gucunski spoke to a full room of NJDOT employees about the benefits of nondestructive evaluation (NDE) technologies for bridge assessment and latest advancements in the field. The benefits of NDE are many, but ultimately the value is realized by its ability to help bridge owners make better-informed decisions regarding maintenance, repair, and rehabilitation of vital infrastructure. New Jersey serves as the perfect laboratory for the development of such technologies, given the myriad of aging bridges in the state and the congestion that demands bridge evaluation be done quickly, but as safely as possible. Dr. Gucunski highlighted two of CAIT’s breakthrough platforms to achieve these goals, the RABIT™ and the BEAST. This robot increases the speed that data are collected and analyzed as well as reduces the cost of assessments and lessens traffic congestion associated them. Most importantly, it improves the safety for workers who are no longer required to perform lengthy inspections in high traffic areas. Dr. Gucunski presented the results of various NDE surveys that had been completed by the RABIT™ from around the country, highlighting the demand and efficiency of such technologies. Furthermore, the robot is able to evaluate the state of bridges as well as perform minor rehabilitation repairs. When the robot sees delamination occur below the surface, it can bore a hole into the bridge and flood the cracking with a sealant that NJDOT employee Dr. Giri Venkiteela was instrumental in creating. Dr. Gucunski also focused the spotlight on the BEAST, the next level of bridge deck evaluation. While the RABIT™ can be used to evaluate the current bridge inventory through safe and non-destructive means, the BEAST tackles the problem in a different way: by actively speeding up the impact and deterioration of bridges to give researchers a look how bridge systems will fare over in the future. The BEAST tests sample bridge spans up to 50 feet long and 28 feet wide using rapid-cycling temperature extremes, simulated precipitation, and a loading device that inflicts the same kind of beating as 24-7 heavy truck traffic. The BEAST “compresses time” and demonstrates decades of deterioration in only a few months. The BEAST offers a unique insight on the future performance of materials and structural components, supplying bridge owners with information that could previously only be realized after decades of wear and tear. This technology will help with the design and materials used for bridges that have not yet been built, allows for a better understanding of how current bridges may fail, and can help identify the best rehabilitation and preservation techniques. New Jersey’s infrastructure is amongst the oldest in the country, with over a third of our bridge systems deemed structurally deficient or in need of repair. Since it is logistically and financially impossible to repair every single bridge, these two technologies help expand the lifespan and performance of the bridges we have today. For more information on this tech talk, and for other presentations in this series, please visit NJDOT Tech Transfer website, njdottechtransfer.net/tech-talks. 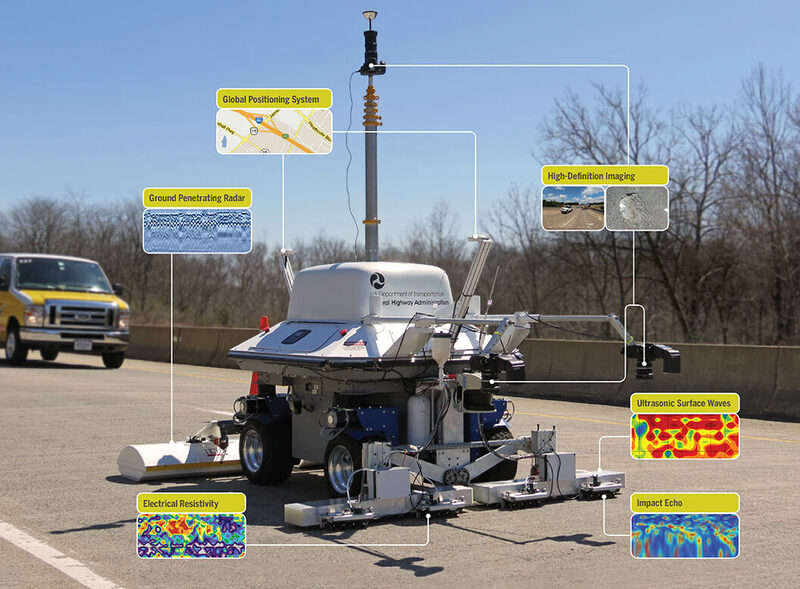 RABIT™ deploys several NDE tools simultaneously to gather data on various aspects of bridge deck condition, e.g., corrosive environment, subsurface cracks, concrete deterioration. Photo: ©Drew Noel Photography for Rutgers CAIT. The BEAST accelerated bridge testing lab under construction. Photo: ©Drew Noel Photography for Rutgers CAIT.